Over the last 6-8 months I have done the absolute bare minimum when it comes to cooking and feeding my family. 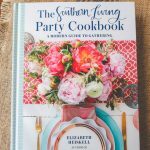 If you’ve been a long time Peanut Blossom fan, you may have noticed a remarkable drop in the number of recipe posts I’ve shared. The few that made it through were only shot because of a food photography challenge deadline. Between some dietary restrictions and my family’s infamous picky eating habits, I lost the will to cook. We’ve been surviving on a sickly rotation of buttered noodles, macaroni & cheese, pizza, and the one dish we could all agree on, my sticky chicken and rice. Guys, this is not me. Not only do I love to cook but I firmly believe in the power of family dinner. The obstacles in front of me felt insurmountable, I felt like I didn’t have enough support from the ones eating my food, and it all felt like an unbelievable waste of time, energy, and money. And then I hit rock bottom. I realized that Little Pea couldn’t even name a vegetable when asked what her favorite one was. All the “Make them try it 20 times before you even hope to see them tolerating it” advice came rushing at me and I realized how much I had truly just given up. How would things ever get better if I didn’t help them along? In a fit of frustration, my heart finally opened enough and I finally gave Zina’s approach some consideration. 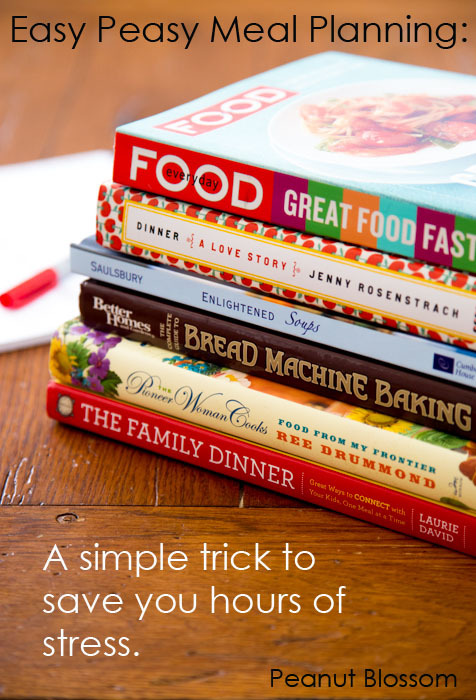 I knew she had been inspired by The Family Dinner: Great Ways to Connect with Your Kids, One Meal at a Time which is one of my favorite books along with Dinner: A Love Story. Our end goal was the same: feed our families more healthfully and leave enough time for this to be a special time, not a stressful one. I am here to tell you, it’s an amazing Christmas miracle the difference this has made for my family. The difference it has made for me. I have rediscovered the joy of feeding my family. I am excited to get into the kitchen in the evening. I am back to stocking my freezer. And the simple secret?? Assigning general themes to each day of the week for your meal plan. At first I thought it would be too limiting. Now I see the freedom of exploration it provides! I worried we’d get sick of the rotations. I didn’t realize how open the theme could be. I couldn’t imagine a pattern that would work year round. I’m already planning my warm-weather tweaks! Last night? My kids ate Shrimp Scampi instead of takeout pizza because I had the ingredients on hand! Monday: Soup & Sandwich Night — I will be experimenting with the dozens of ideas from my favorite cookbook Enlightened Soup and pairing it either with a homemade bread from this bread machine baking book or with fresh baked biscuits from a tube or a grilled sandwich. (When warmer weather comes around this will switch to Salad for Dinner Night and still involve fresh bread.) Please note: these are books I’ve already had in my library but which were collecting dust! Tuesday: Crockpot Night — This is one of our busy after-school days. I will plan ahead in the morning so something hot is waiting for us when we get home. Wednesday: Noodle Night — My family could eat pasta every night of the week and be happy. This ensures my kids that at least one night of the week something “easy” and 100% acceptable will be on their plates. Thursday: International Night — This was the trickiest thing for me to work into the routine. We love to eat a wide variety of foods: Greek, Chinese, Mexican, Thai. I didn’t want to dedicate one whole night to each of those. Yuck. Rather, I look at this night as more of a free for all for our more adventures recipes. I will likely work in those flavors into other nights of the week (Tortilla soup on Mon., Sweet & Sour Meatballs on Tues. in the crockpot) but this is the one night where I’m guaranteed to turn to one of our favorites (chicken gyros for example). Friday: Family Game Night & Pizza Night — Depending on my mood that pizza might be homemade, it might be frozen, it might be delivery. Saturday: Date Night OR Family Movie Party — This will be our “Popcorn for Dinner” night or we’ll eat out at a restaurant (alone or with the kids). Sunday: Casserole Or Sunday Roast — With the extra time on Sundays, I can do a traditional roasted meat & potatoes meal or if we’re busy having fun, a casserole fresh or from the freezer. 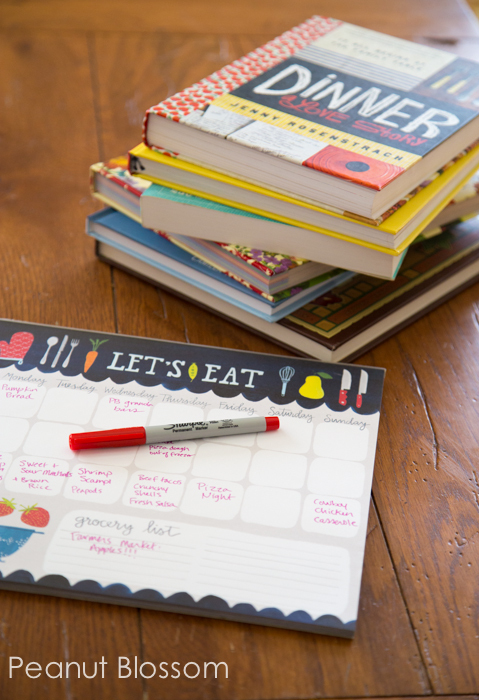 Edited to add: The adorable meal planning pad I have is sold here. I love it because it has a magnetic strip that sticks to the fridge!! But the sheets are tear-off so you could display it any way you like. The bottom half is a perforated tear-off grocery list which is handy too. 30 minutes: Once you have your themes, meal planning is just a matter of plugging in the weekly favorites on the appropriate day. I can pick our meals and write the master grocery list in 30 minutes or less. And that’s if I’m being extra fussy. One trip to the grocery store: You’ve planned the week out, you’ve done your shopping. You’ll have everything you should need for a whole week! I used to practically live at the grocery store! Frees up mental agony: I keep my menu on the fridge. I never have to guess what’s for dinner ever again. I know exactly what prep work to do during small pockets of time throughout the day. Prep a veggie here, mix a marinade there, pull the pizza dough from the freezer for tomorrow. Opens time for baking: I now have time to make my favorite from-scratch foods because I’m not running to the grocery store all the time! And my fridge is stocked with the right ingredients. I pick one or two things to bake each week and add the ingredients to my one shopping list. I bake them when I have time and am in the mood. 1. What are my family’s very favorite meals? If I had all the time in the world and the ingredients were handed to me on a platter, what would we enjoy eating? Make a list! Ask your husband and kids to chime in. 2. Now look at that list, do you see any patterns? Are they all chicken? Then it isn’t exactly helpful to have a “Chicken Night” because it doesn’t narrow your options. You want to consider themes that help you make your weekly decision more easily. It should be broad enough to give you options but narrow enough to shorten that list. 3. Consider your goals. I wanted to start making better use of a few particular cookbooks. They are ones that I love but forget to turn to. Now they are my go-to sources for some of my weekly themes. I also wanted to make better use of the kitchen equipment taking up precious space in my cabinets. By assigning the bread maker and crockpot their own dedicated evenings, they’ll start to earn their keep. You can bet the ice cream maker will be getting an evening assigned to it come June. 4. What do you need help remembering? I needed help remembering particular recipe sources and gear. Maybe you need help to remember to eat a new protein? Or to try a new recipe? Use one night of your themes to help be your Post-It note reminder to work towards your goals. Ideas could be: Seafood Night, Make our own takeout, Grilling, Vegetarian or Try a New Veggie Night, Use my baking stones Night, Eat from my Freezer/Pantry Night. 5. Look at your schedule, which night is your busiest? Do you have more than one? Consider time-saving meal themes. For me that was the crockpot but sandwiches, simple pastas, even breakfast for dinner are all themes that would work with a constricted time schedule. Or if you’re really that busy, how about picnic night?? Pack foods for a cooler that you’re eating in the car on the go so you can avoid the drive thru! Or heck, give yourself a “Drive Thru” night but be intentional about it. It’s amazing the guilt it relieves. 6. Which day of the week is best for you to grocery shop? Plan your weekly rotation starting either that day or the next. I meal plan on Sunday, shop on Monday morning, the week starts Monday evening. Post by Let’s Lasso The Moon. 1. I’ve created a page on this site where I will document and share which recipes fit under each theme. Consider it my Master Dinner Index. View it here. It’s a little barebones right now but I will add to it as the weeks go by. 2. Every Sunday I will also post my weekly plan and then edit the post with what worked and what didn’t at the end of the week. View them here. Looking for more inspiration? 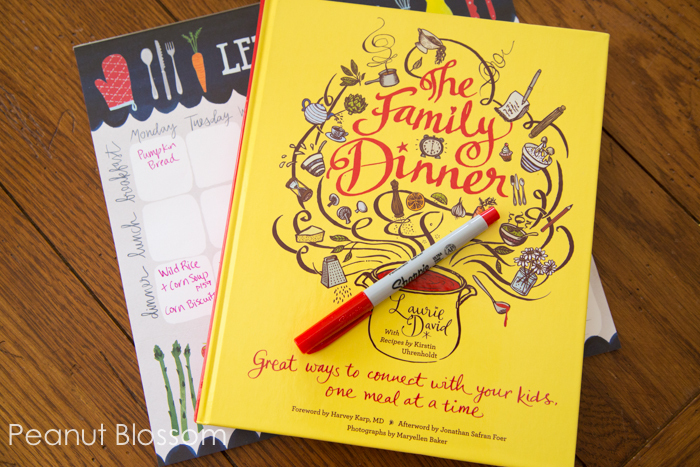 Check out these fantastic resources for more meal planning help! And be sure to follow along over on Facebook at Peanut Blossom & Let’s Lasso the Moon. Disclaimer: This post contains affiliate links. View our full disclosure here. What a great idea! I have been stuck in a huge rut in meal planning for my family. I’m going to give this a try. Thank you! This post is perfect at the moment, I also have been in a dinner rut! 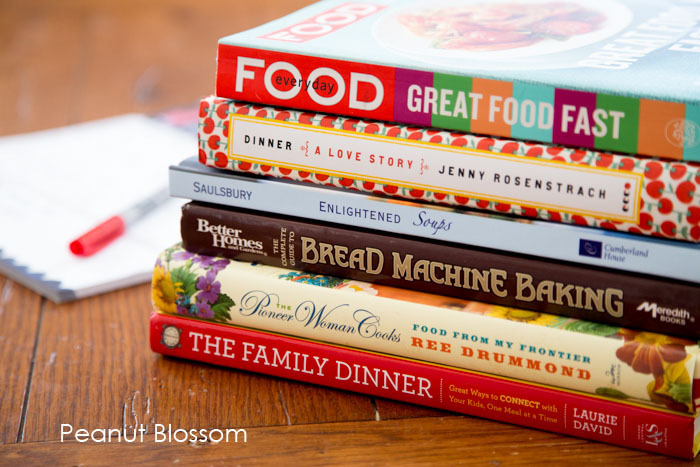 I went through cookbooks this past week and still have no inspiration. My family all are eating different things due to diet restrictions, so dinner is a struggle. I believe in family dinners, so it stressful. I’m going to read your post and get some inspiration. Hit the grocery store running tomorrow!! This is what I do too! Except I haven’t gotten the whole grocery shopping thing quite down yet, and I need to explore new recipes more often. Sunday – Crock Pot – unfortunately I have NO time on Sundays! I wish I could do a full traditional Sunday meal, and I’d love to find a way to “make ahead” that delicious mealtime from my childhood! You can always make the traditional roast, potatoes and carrots in the crockpot or you can also blanch your potatoes and carrots and put in freezer bags along with your roast and then all you have to do is throw everything in a crockpot and let it cook! I love it! Julie, I love those themes!! Quick Fix might be too loose, but if it is working it is a great idea. For your Burgers theme, I immediately think of Rachel Ray! Doesn’t she have something like 1,000 different burger recipes?? You could totally be adventurous on that theme! I might have to add that to our summer rotation next year! I will consider your suggestion about wanting to do Sunday Dinner ahead of time. That gives me a challenge for future posts!! Hope you’ll check back. As far as our grocery service, it’s actually our local grocery store, Harris Teeter! You can order online and they have drive-thru pick-up service. It was one of the very best things about our move to Charlotte, NC last year. I honestly don’t know why more stores don’t offer it. THANK YOU!! I have a family of 5 I am cooking for. My husband is no gluten, dairy, soy, sugar, or corn. My oldest and my youngest is a great eater. My middle child is very picky. I dread meals. We eat organic most of the time and I make a lot from scratch because of my husbands enormous food allergy problem. You ideas are short, sweet, and to the point. I like that you have a picky eater. Any ideas in that department would be greatly appreciated!! I totally understand how difficult it is to try to plan meals with picky eaters who special dietary needs. My son is allergic to nuts and my daughter is going through a vegetarian phase. I’ve been using Foodniche.me which allows you to sort for recipes by special dietary needs. It’s helped a lot. Have seen theme nights for meals all over Pinterest, but your story and your themes really resonated with me. Thank you! 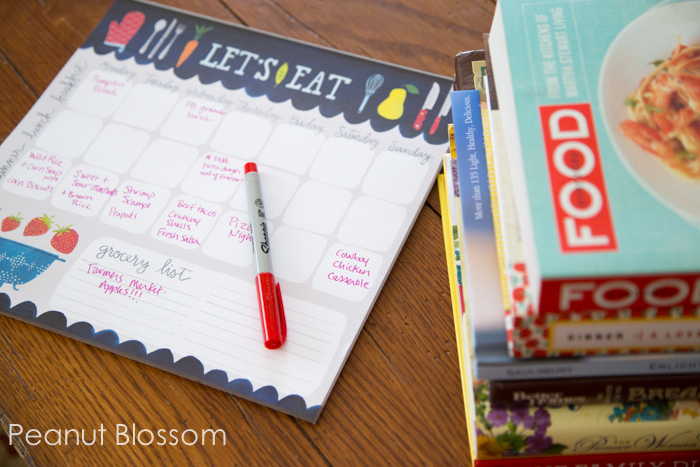 Where did you find the let’s eat menu planner? I want something just like those!!! Love this post! Where did you get that super cute menu planner? There are only 2 nights of the weeks that are “permanently planned” for us – LOL Thursday night is leftovers/sandwiches night and Friday is our Movie night (pizza and popcorn). Getting the other days situated takes some time and thinking. I’ve been doing the same thing when I plan menus, but I do Soup and Sandwiches on separate nights. My goal is to try most of the recipes I’ve pinned on Pinterest. That should take a decade or so! Sadly, my kiddos are all older (college, high school, middle school) and my husband works out of town, so sitting down to dinner with all of us present is getting harder and harder to do. Still, leftovers make good lunches! Thanks for this. I used to do this exact same method a while back, and it saved me so much time, stress, and money. Our themes were Crockpot night, soup night, pasta night, breakfast for dinner night, mexican night, asian night, pizza night, and leftover night. It’s like you know me personally and wrote this about me!!! I also lost interest in cooking a few years ago. My BF and my 6 year old wouldn’t eat what I cooked, because it was HEALTHY! I think you may have kicked me back into meal planning and cooking mode hahaha. My kids are a bit older (8th grade, 5th grade, 4th grade) and we cook and eat at home almost every night. I have been meal planning for a long time, now, and I love it. The kids’ schedules have become more complicated and vary more. I make the busiest night of the week a crock pot night, too. The only suggestions I would add would be to leave at least one meal on the weekend for leftovers. Even with the kids and my husband and I taking leftovers for lunch most days, we almost always have at least 1-2 meals extra in leftovers each week. I also would suggest that you allow yourself a bit of wiggle room in your menu. For example, this week, I planned to make black bean and sweet potato burritos for supper on Monday. I got home late, made the speedy pasta planned for later in the week and saved the burritos for another night when I knew I would have more time. Happy Cooking!! I can’t tell you how much I love this idea. Planning out my themes now. This is genius. What a great idea having themes. Have never thought about doing it this way! I love your idea of sticking with a theme for every day, that could totally work for me and you are eating something different but still know what type of food/recipe to go for. So clever! When I started reading, I felt like I was reading my story!! I had become so tired of cooking for nothing. Everyone is so picky. I believe this is going to help me turn it around. Thank you so much. I was wondering if I would be able to share a link to this on my blog? I love what you have to say about bring family meals back. My family and I used your meal planning today, to plan our week. This is normally a big fight for us and you made it so easy to theme the days. I have shared with you my website so you can see I am not a “bash another blogger” type person. I just want to share with people where I got all the great ideas. This is the most thorough blog entry about meal planning I’ve ever read. I love it! And thank you so much for your time and hard work you put into writing this out. You rock! I dread meal planning but I might be able to stick to something like this. Great article Tiffany, I love the story how you found the way to really enjoy the cooking. Cooking for family is a real game changer when it comes to finding motivation to spend time in the kitchen. I do prefer to organize theme food nights for my family, but this is not some type of rule we embedded into our weekly planning. Having all days organized by themes is a huge helper and as you said it eliminates the mental agony when we are about to decide what to cook next week. But first, I’ll have to interview my family members before coming up with some food themes and recipes. This has been so helpful! I too, had been a skeptic of themed nights for our family menu, but after reading your detailed explanation, it makes so much sense. I am excited to try it! Thanks for the tips. Thank you for a realistic, real-life approach to family blogging! 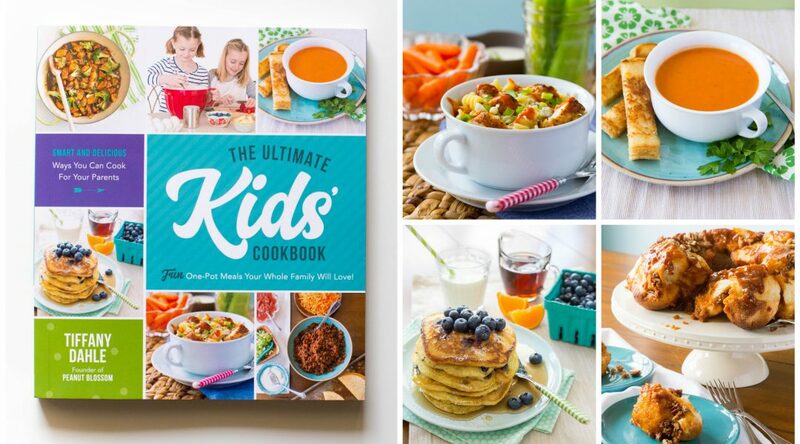 It’s so encouraging to see some sweet imperfections and getting ideas for how to manage them, instead of the spotless, glossy beauty of “amazing meals and photos of my kids enjoying every one of them!” THANK YOU! Can’t wait to start implementing!